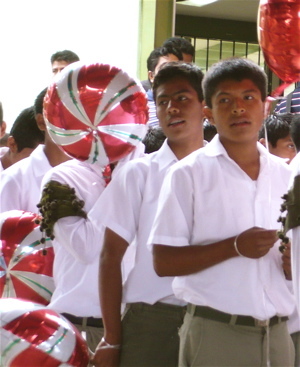 An eighth grade education is mandatory in Mexico, and today we celebrated Omar Chavez Santiago’s graduation marking this milestone in typical Zapotec pomp and circumstance. 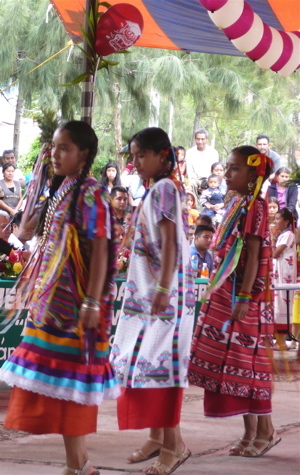 There were 73 students who completed the Escuela Secondaria de Teotitlan del Valle in a three hour ceremony that was more like a mini-Guelaguetza. 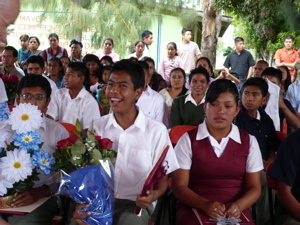 About half of the graduates will continue on to attend high school in Oaxaca City. The rest will farm or weave or apprentice a trade. 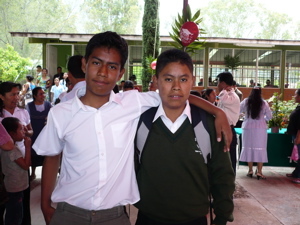 Omar who is age 14, will have a one month break and then hop the bus every day starting August 11 for the 40 minute trip to a private high school where he will begin a college preparatory education. His favorite subject is mathematics. Omar weaves beautiful rugs, too. 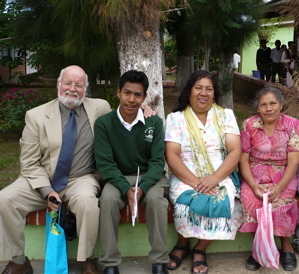 We went as madrina and padrina (godmother and godfather), designated by Federico Chavez Sosa and his wife Dolores to represent the family and stand with Omar as he received his diploma. We took lots of photos because Federico and daughter Janet had left yesterday on an overnight bus to Mexico City where they had a visa appointment at the U.S. Embassy this morning, so they could not attend. 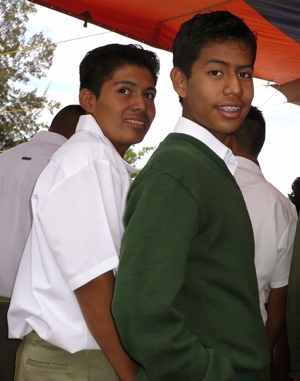 (Buenas noticias: they both got 10 year visas for the trip they are planning to the U.S. this fall.) We wanted to be sure they got the full flavor. 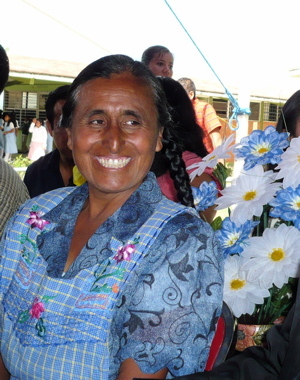 This morning Stephen took the wheel of the ancient dark blue Toyota pick-up and Dolores took the seat beside him. I climbed into the flatbed and Tia Ernestina climbed over the bumper to join me. She handed me a huge bouquet of flowers and a gift bag that Stephen and I would later present to Omar. 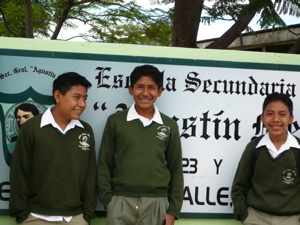 We rode the six blocks to the lime-green painted school to get there just in time for the 9 a.m. start. 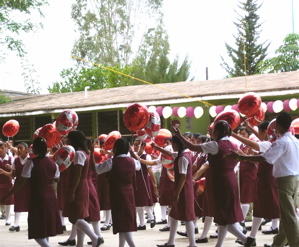 As we entered the courtyard, I saw students clustered in small giggling groups, the band was pinning on their epaulets and blowing trumpet blasts and banging drum rolls, and the soon-to-be graduates clutched strings tied to big red and white striped tinsel balloons. 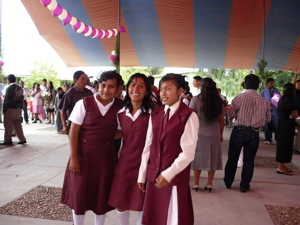 The girls were dressed in light blue, pink and maroon uniforms depending on their school year. 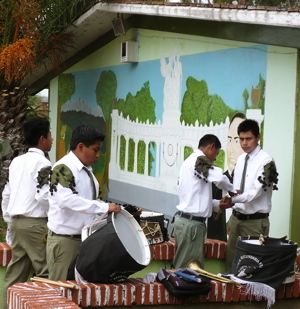 The boys wore short-sleeve white shirts, khaki pants, and matching khaki sweaters. It was buzzing and humming with excitement and energy. There weren’t many people there and it was 9:10 a.m. For the next 50 minutes, families streamed in under the huge red and blue striped tent adorned with purple and white balloons. Mothers, fathers, grandparents, aunts, uncles, brothers, sisters and cousins carried floral bouquets and arrangements, some so large they hid the carrier. Each took their seats on cement bleachers. 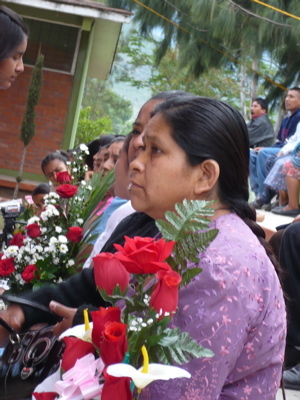 Dolores looked at me and Stephen, we all looked at each other and realized that the ceremony was called for Teotitlan time, which is one hour later than Oaxaca time (which is what most of us go by) — a source of constant confusion in the village. 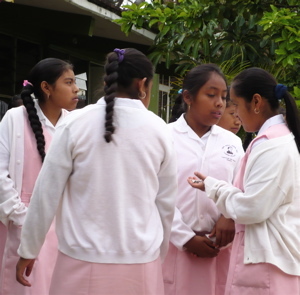 Patience is the most valuable attribute one can have in Mexico. By 10:15 a.m. it was standing room only. 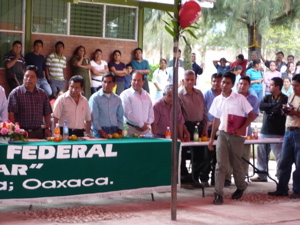 The school administrators and a long line of village and state education and committee officials took their seats at the head table, and the ceremony began with the singing of the Mexican national anthem. 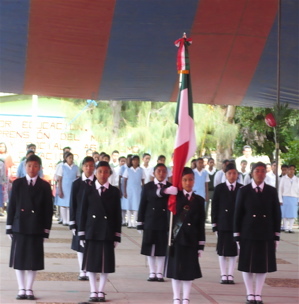 An honor guard of young women dressed in serious navy blue and chosen for their academic achievements, unfurled the red, white and green Mexican flag. 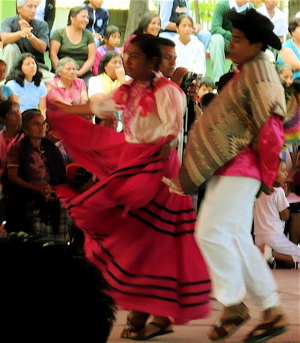 There is a strong sense of nationalism and reverence for independence in Mexico. Every village and city has a Calle 20 de Noviembre, Calle Independencia, and Calle Benito Juarez. 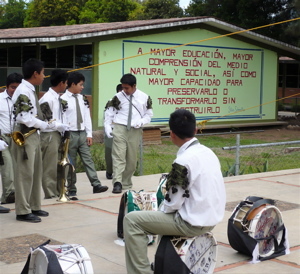 In this indigenous village, all the students recited the national anthem, yet only about half the audience participated. 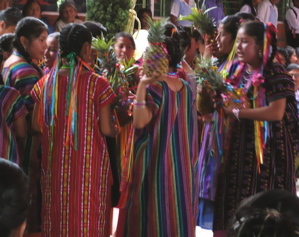 I don’t know whether this is because they didn’t learn it because they didn’t attend school or their Zapotec allegiances are stronger than national pride. 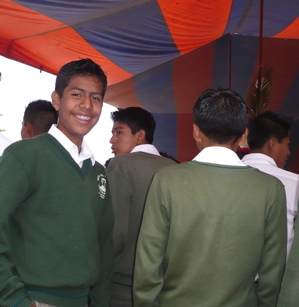 After the anthem, Omar came to get us and we took seats two rows behind him and his classmates on the other side of the tent opposite from the bleachers, joining the others who would participate in the graduation ceremony. 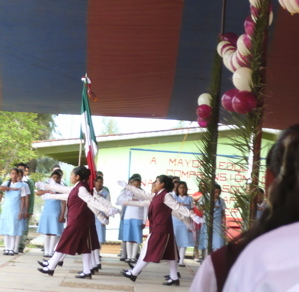 The middle school is noted for it’s folkloric dancing program, and interspersed between the awarding of the certificates of meritorious achievements, the homilies to the value of education given by various directors, teachers, and civic leaders, we were entertained by costumed students who presented the dance traditions of various regions of Mexico. It was fabulous! 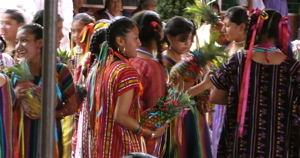 Our own private Guelaguetza. 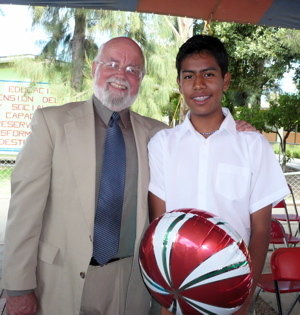 Then, at about 12:15 p.m., came the awarding of the diplomas. 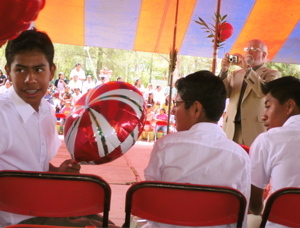 Omar Chavez Santiago was in the second group of students to receive their diplomas, and Stephen and I had to pay attention to the protocol. 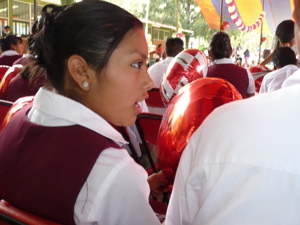 We watched the first group to receive their diplomas very carefully. 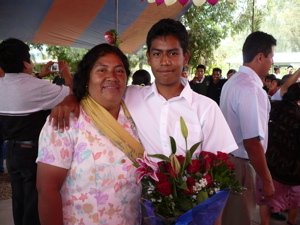 Then, Omar’s teacher announced his name and said he was being received by Norma Hawthorne and Stephen Hawthorne. 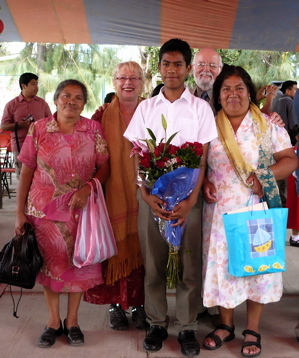 Omar walked to the table of dignitaries to receive his diploma and shake each of their hands, as we walked to the center of the tent, me carrying the bouquet of red roses and lilies and Stephen carrying the gift. We stood to receive him and gave him a huge hug and kiss of congratulations. Omar’s uncle Raoul came up to take photos, and then we went back to our seats. 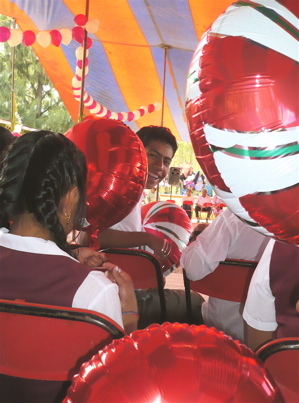 When all had received their diplomas they gathered in a group and released their balloons to the sky. With that the ceremony ended, and in great graduation fashion all over the world, there was a huge mingling and hugging, and kissing, and camera flashes. 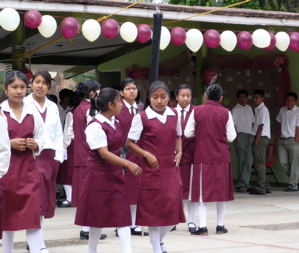 As we exited the school yard, the tuk-tuk moto taxis clustered, and at least five nieveria (ice cream carts) attendants were dishing out cones and cups to proud graduates and family members. We headed off to El Descanso for lunch. 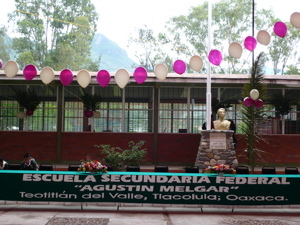 This entry was posted in Cultural Commentary, Oaxaca Mexico art and culture, Teotitlan del Valle, Travel & Tourism and tagged education Oaxaca villages, family traditions, Mexico education, middle school graduation ceremony, Oaxaca, Teotitlan del Valle. Bookmark the permalink. why did he choose an american guy as a godfather? The American Guy is my husband Stephen. We are included in and considered part of the family, so it was quite an honor for both of us to be invited to be Omar’s godparents. 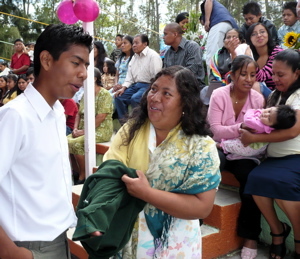 We both were named by the school and village officials at the ceremony and asked to step forward to give honor and blessings to the graduate!